The mediacounts stream holds counts of how often an image, video, or audio file from upload.wikimedia.org has been transferred to users. WMF currently does not have infrastructure to provide perfect media counts, and the current media counts implementation has several shortcomings. But since the community had been waiting for ages already to see any media counts, we published this non-perfect data nonetheless to get data out until WMF has infrastructure to produce perfect media counts. Rationales, and motivations for this dataset can be found in the corresponding RfC. See also the March 2015 announcement email for this feed. HTTP status code 206 (Partial Content) and a Range header that starts in bytes=0-, but is not bytes=0-0. The first condition matches the plain fetches of image, movie and audio files. The second condition matches beginnings of streamed media. After some discussion with stake-holders (some parts in on-wiki, most parts in emails), requests with HTTP status code 304 (Not modified) do not get counted at this point, as more interest seems to be on media transfers than media requests. Ideally, it would be media consumption or media views, but there is currently no way to detect that easily from the logs. When consuming streamed media and jumping back to the beginning of the file after having watched part of the file, counts as a new transfer. When using Media viewer to view images, some images are prefetched for better user experience, but need not yet been shown to the user. Currently, those prefetched images are getting counted, as there is as of now no way to detect whether an image was actually shown to the user or not. The number of preloads might be as high as 50% of total requests for the file types supported by media viewer. 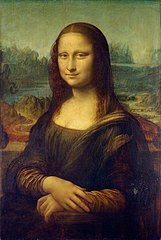 , the base_name is /wikipedia/commons/e/ec/Mona_Lisa%2C_by_Leonardo_da_Vinci%2C_from_C2RMF_retouched.jpg. base_name is normalized, and has special characters percent escaped. For images from Commons, you can get the file's page by replacing the first four path segments of the base_name by https://commons.wikimedia.org/wiki/File:. So for the above basename, the file's page on Commons is https://commons.wikimedia.org/wiki/File:Mona_Lisa%2C_by_Leonardo_da_Vinci%2C_from_C2RMF_retouched.jpg . 2 total_response_size Total number of response bytes sent to the users for that file (and its transcodings). 3 total Total number of transfers (counting both transfers of the raw, original and tiny thumbs as 1). 4 original Total number of transfers of the raw, original file (transcodings, thumbs and the like are not counted here). Note, this includes JPG images embedded in pages without the thumb parameter or equivalent, as well as the "thumbnails" asked at a resolution equal or higher than the original image's resolution: in both cases in the original image is embedded directly (and downloaded upon visiting the page), rather than generating a derivative image. See example. 5 transcoded_audio Total number of transfers of a file that got transcoded to an audio file. So for example when a FLAC file is requested as OGG file, the request is counted in this column. (Transfers for the raw, original FLAC file, would get counted in the original column. 6 n/a Reserved for future use. 7 n/a Reserved for future use. 15 n/a Reserved for future use. 16 n/a Reserved for future use. 21 n/a Reserved for future use. 22 n/a Reserved for future use. 23 referer_internal Total number of transfers with a Referer from a WMF domain. 24 referer_external Total number of transfers with a Referer from a non-WMF domain. 25 referer_external Total number of transfers with an empty or invalid Referer. The stream is available as daily TSV files at http://dumps.wikimedia.org/other/mediacounts/ and http://wikimedia.crc.nd.edu/other/mediacounts/ . The stream is available as daily TSV files at /wmf/data/archive/mediacounts in the Analytics cluster. In addition to those files, the data is also available at hourly granularity in Parquet format at /wmf/data/wmf/mediacounts, which is accessible in Hive through the wmf.mediacounts table. mediacounts-stats.py can filter statistics for a specific file or category of files, keeping the same CSV format (example). commons-media-views compacts the entire dataset to have only one row per filename and outputs the table in JSON format (example). This page was last edited on 3 December 2018, at 18:04.